I had to go to Kmart today and purchase some household supplies. I also had to stop by Kmart's greenhouse. It was my first stop at a greenhouse in 2012. Temperatures here in Northern Minnesota are still pretty cool, even during the day. 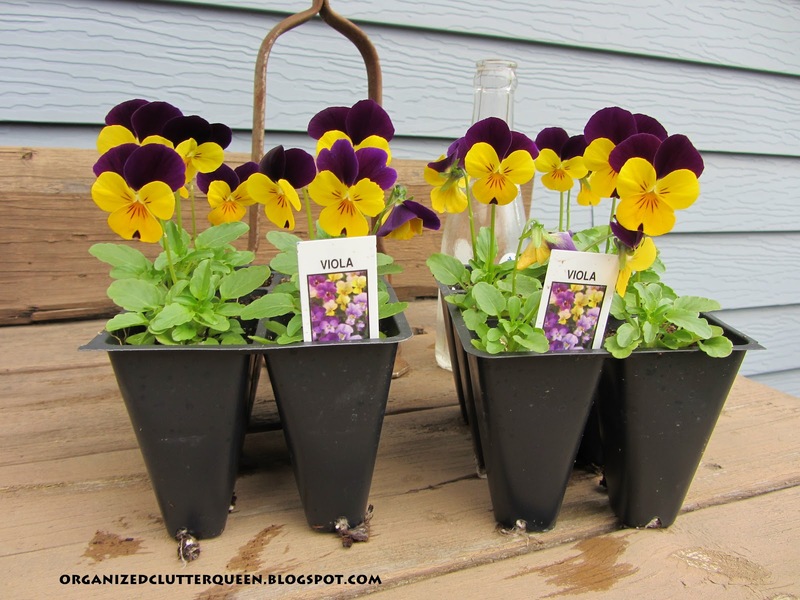 Two little six packs of violas. Pretty hardy! This is one of my color combinations for this season, purple and gold. My youngest child is graduating from high school, and purple and gold are the school colors. Some of the purple and gold containers will be used for our grad party! 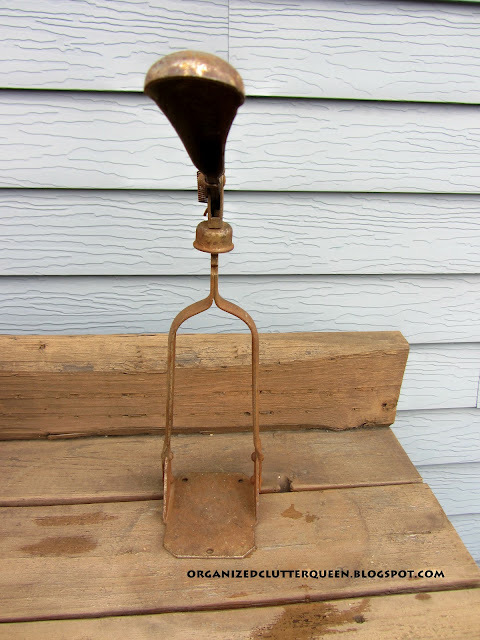 Remember my vintage bottle capper that I found earlier this spring at a thrift/consignment store? I just purchased this bottle today for $5 at an antique store. Don't know much about it. 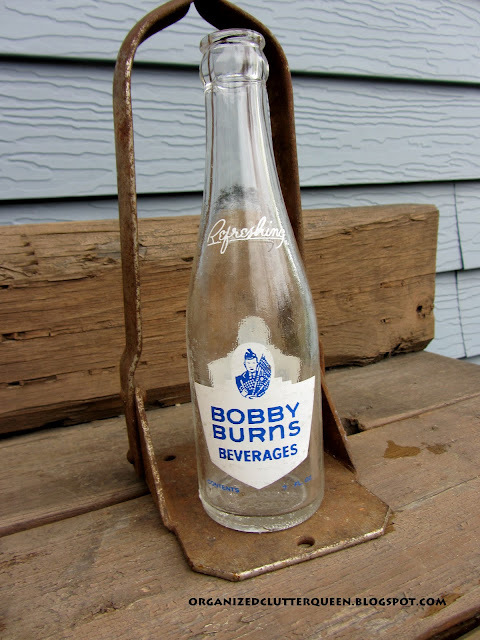 It's labeled Refreshing Bobby Burns Beverages. Hoping it warms up enough to buy some more plants and not have to wait until Memorial Day Weekend for planting! Very cute and cheery! I wouldn't have known what that object was! 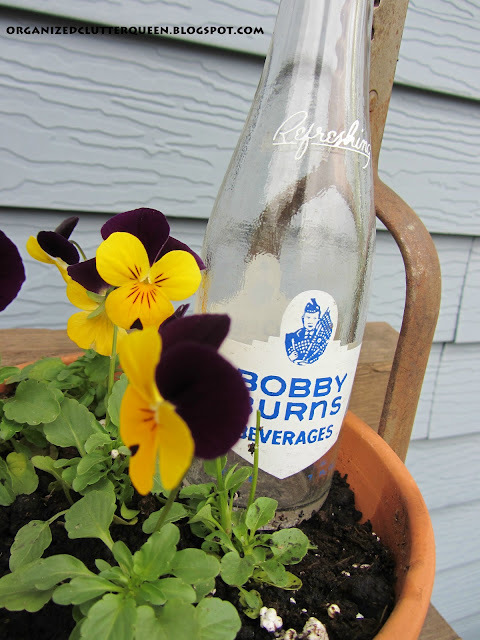 Carlene, The Bobby Burns bottle is so neat..love the way you displayed it with the bottle capper and the darling violas. Hope you get some warmer weather soon. I'm late planting in the garden. I haven't even put our one tomato plant. I'm thinking of doing only flowers in the garden this year, instead of tomatoes and peppers. Oh goodness, that is so cute! I love it! Great job! LOVE it! That is so cute. Would never have thought of that. 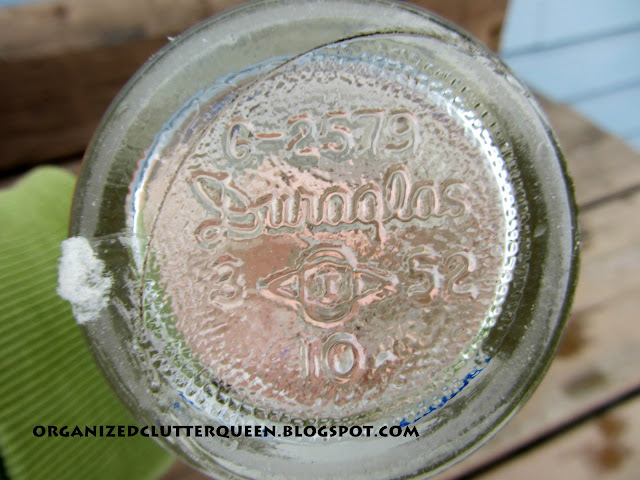 ps - i host a garden party on thursday's ~ would love to have you link up! Love your bottle capper flower arrangement! Perfect for your porch or deck. This is genius (is it sad that my spell check had to correct my spelling of genius - maybe I should stick to words that are 5 letters or less?) 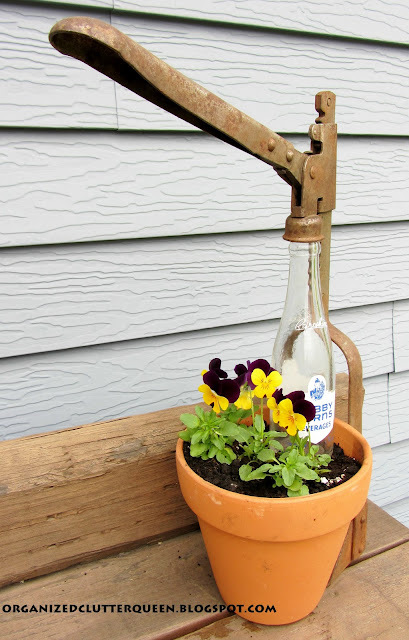 Anyway - I love this...I never would have thought of something so creative. I'm a huge fan of old n' rusty, so bonus points for that too. Thanks for stopping by my blog. Carlene, this is sooo adorable! 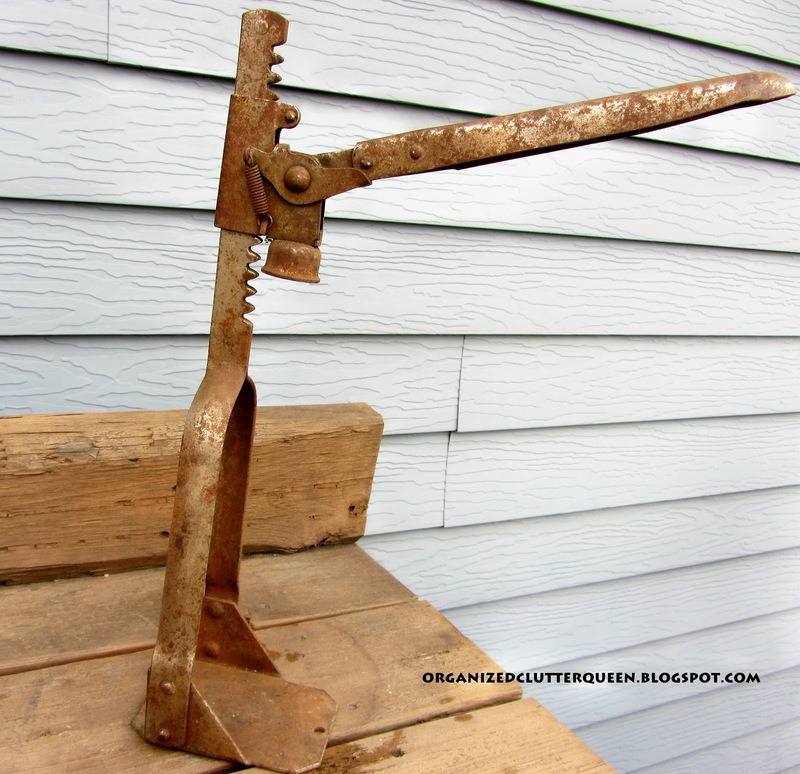 Now you are going to have me running around like crazy looking foe a bottle capper. I love the look! Thank you so much for stopping by, always a treat. How perfect are those pansies for the grad party?! One of my favorites. They look pretty cute with the vintage set-up. I hope it warms up, too! 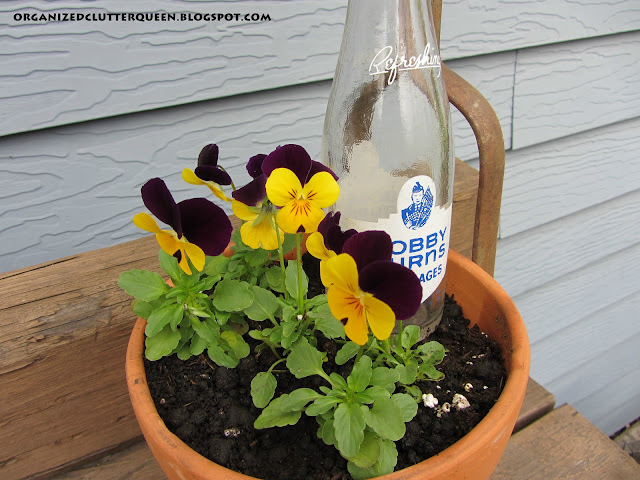 Hi Carlene, I have been planting my little heart out today. I think it's finally safe here. I love Viola's. I had an Aunt Viola and have been given many vintage items that were once hers. She only had one daughter and we are close. My Aunt was more like a grandma to me. All of my grandparents had passed when I was born. I love your vintage find. I have never seen a capper. So, so cute! Thanks for sharing with Share Your Cup. What a cute little display, this would fit in perfectly to my moms backyard!! Thanks for sharing and I am a new follower! 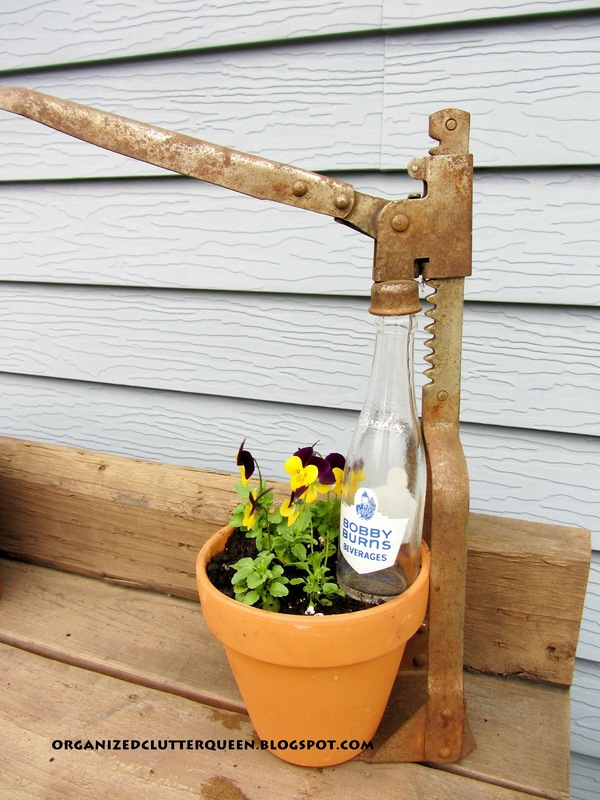 Oh my, I've never seen a bottle capper before. You made it into a lovely display. I'm now one of your newest followers, drop by for a visit when you can. Thanks, we have one of these and I've never known what to do with it. This gives me ideas!